The autonomous community of Murcia is Spain’s largest ‘one province’ community. Situated in the south-east of the country, it can be divided into very differing geographical areas. The largest river of the region, the Segura, acts as the main source of irrigation for Murcia’s best farming lands, the fertile plains, or ‘huerta’, but other parts of the province experience serious drought conditions; there is an annual rainfall of less than 300 mm. The highest points of Murcia can mostly be found in the Parque Natural de Sierra Espuña and the Revolcadores Massif, with some impressive pine forests. The other main point of interest geographically is the impressive Mar Menor, a 65 square mile salt water lagoon separated from the Mediterranean by the long strip of La Manga. The 177 mile coastline known as the Costa Cálida, although becoming more popular recently, is still nowhere near as developed as some of the other southern Spanish costas. Murcia’s economy is very dependent on both agriculture and tourism. Oranges, lemons, grapes, tomatoes and lettuces are grown in abundance here and, largely thanks initially to the development of the La Manga Resort Club and other golf resorts, the area’s touristic appeal has increased dramatically in recent decades. The economy of the region has undoubtedly benefitted from the number of Northern Europeans who now have homes here – either permanently or as holiday accommodation. The Phoenicians, the Greeks and the Carthaginians all settled in Murcia at different times although there are cave paintings near Cieza, Jumilla and Moratalla which indicate a heritage even older than those. The Carthaginians established a permanent trading post on the coast which later became Carthago Nova under the Romans, who first fully established the region. The Arabs, under the control of Abdelaziz, seized the area in 713 after a battle at Cartagena bringing with them their systems of irrigation to enable the previously barren land to be farmed. After their defeat at the hands of Alfonso X in 1243 the region lost much of its significance and, indeed, much of its territory, which was annexed by its more powerful neighbours. It was in the 18th century that the city of Murcia and the province as a whole found their most glorious times, thanks mainly to the silk industry that developed there. The name Murcia itself is derived from the Latin word for mulberry, murtae, the tree that fed the silkworms in the region for hundreds of years. The majority of Murcia experiences a Mediterranean-type climate of hot summers and mild winters. With about 2,800 hours of sunshine each year, the average annual temperature is 18°C. Apparently the official highest 20th Century temperature in Spain was recorded in Murcia in July, 1994 – a mere 47.2°C. The differences in temperature between the coast and the inland regions are much more pronounced in the winter with temperatures seldom falling below 10° on the coast but being much cooler in the mountains inland. Generally, there is very little rainfall in the region, with hardly any in the summer period. In the coastal areas there are few days of rain throughout the year but the majority of the precipitation will fall in spring and autumn and is often concentrated into a few very wet days. The coast experiences about 300 mm of rainfall annually but the mountain areas can expect about twice this amount. By Air: Murcia airport lies 48km from the city of Murcia in San Javier on the northern shore of La Manga del Mar Menor. There are few regular flights to Murcia operating all year round since Ryanair dropped a number of their routes although additional summer services are provided by several budget operators. It is mainly used by visitors to the Costa Cálida but is also an option for visitors to Torrevieja and other resorts of the southern Costa Blanca. A new airport at Corvera should eventually replace Murcia-San Javier but its proposed opening date continues to be delayed. By Train:There are good rail links to both the city of Murcia and to Cartagena and Lorca so it is possible to take a train direct to Murcia from Madrid, Valencia or Alicante. Timetables appear on the RENFE in English website. By Bus: Murcia, Cartagena and the other major towns of the area are well served by local buses, most of which are now air-conditioned and very new. Latbus is the main regional bus service, unfortunately its website is only in Spanish at the moment. In addition, in Murcia itself there is an urban tramline which is useful for tourists. This site is also only in Spanish. By Road: The excellent coastal motorway has made a significant difference to the area, linking it much more easily with the north and south Mediterranean coasts. Taxi Services: Taxis are available just outside the terminal building and will take you to your destination but may be a bit more pricey than pre-booking a transfer. Bus Services: There is a coach service run by Lat Bus to Murcia directly from the airport. You will then have to take another bus to your final destination. Airport Car Hire: Rent a car at Murcia airport with Zest Car Rental who offer great deals without any hidden extras. La Manga Resort: For many years this area has been synonymous with the famous La Manga Club Resort, a sports and leisure resort and popular destination for many British professional clubs looking for perfect training facilities or a mid winter break. The golf courses here are truly spectacular and all the facilities are constantly being updated to ensure they are ‘top of the range’. Even if you don’t stay at the La Manga Club complex it’s well worth a visit and if you go for a meal at one of the many fine restaurants in nearby Los Belones you’re almost certain to spot at least one celebrity whilst you’re there. La Manga del Mar Menor: The actual town of La Manga itself is a fascinating, if perhaps overdeveloped, place. Built on a narrow 22 km ‘sleeve’ of land which separates the Mar Menor form the Mediterranean there is one strip of road leading to the tip of the land at Veneziola. On both sides of the road you’ll find hotels and restaurants leading directly out to the beaches – one side having beaches on the Mediterranean, the other on the Mar Menor. 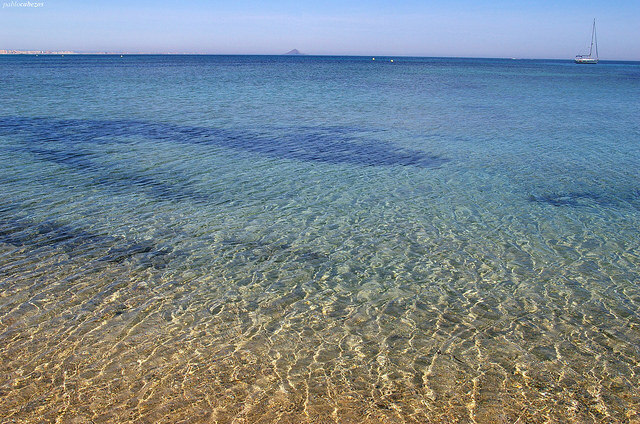 The crystal clear water in the Mar Menor is warm enough to swim in throughout the year and, at 8 metres depth maximum, it’s a great place to practise water sports. Apparently the high iodine and salt content of the water makes it very healthy. With only the one road going up and down the strip La Manga is absolutely packed to capacity with Spanish tourists in the summer but it’s a fabulous place to go for a break in spring or autumn when there’s a little more breathing space. 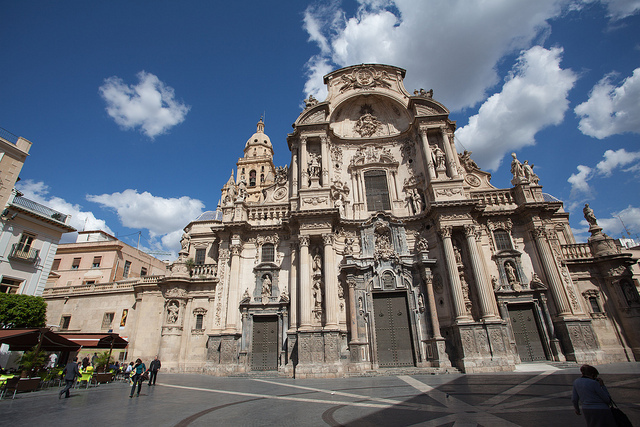 Murcia City: The regional capital, Murcia, is a lovely city in which to spend some time. Founded in the ninth century by the Moors, its main treasure is a wonderfully ornate Baroque cathedral, a delightful medieval quarter and good shopping. As a university town, and with a good number of foreign students on language courses, there is a lively and cosmopolitan atmosphere to the town which is small enough to be able to comfortably see most of its major sites on foot. Cartagena: Cartagena is one of those Spanish ports, rather like Cádiz, that has re-invented itself in recent years. For a long time towards the end of the 20th century Cartagena had quite a sleazy reputation, with most of its industry in decline and a rather dangerous port area. The last city in Spain to fall to Franco it is now a thriving town. The port area has been thoroughly cleaned up and made over and now attracts cruise ships and visiting yachts as people come to see the many Roman ruins available for visitors. There’s also a fascinating National Marine Archaeology Museum and what they claim to be the world’s oldest submarine, constructed in 1888 by a local. If you’re driving in to Cartagena from the Murcia direction don’t be too put off by the run-down nature of the industrial sites on your way in, the city itself is now well worth a visit. Águilas and Puerto de Mazarrón: The region’s two most popular seaside resorts apart from La Manga are probably Águilas and Puerto de Mazarrón to the west of Cartagena and separated by some fine unspoilt little bays and beaches. Águilas was a Roman fishing port and has a good fifteenth century castle. Mazarrón is a name you’ll often see on boxes of tomatoes in British supermarkets but is also a typically Spanish seaside town. Lorca: Lorca is an inland town which was a key frontier site during the Reconquest. It has many beautiful buildings, a terrific castle and has some of the most spectacular Easter celebrations in the whole of Spain. Caravaca de la Cruz: Another key religious site, in fact it is claimed to be Christendom’s fifth most holy site, is Caravaca de la Cruz, directly to the north of Lorca. A Christian prisoner here, in 1232, converted the local Sultan when a group of angels appeared carrying a cross. Every seven years there is an especially sacred year – Annus Sanctus – when the town becomes full of pilgrims. The Church of Salvador is justifiably claimed to be the best example of Renaissance architecture in Murcia and the 16th century Purísma Concepción church contains fascinating mixtures of Moorish and baroque styles. The Parque Natural de Sierra Espuña is a good place for walkers and climbers and never seems to get too crowded as it’s still relatively ‘unknown’. Obviously, with such a wonderful coast, water activities abound but special mention should be given to the small fishing village of La Azohia, near Águilas, which is a great site for divers. There are, of course, some truly spectacular golf courses in the region many designed by some of the most famous names in the golfing world. 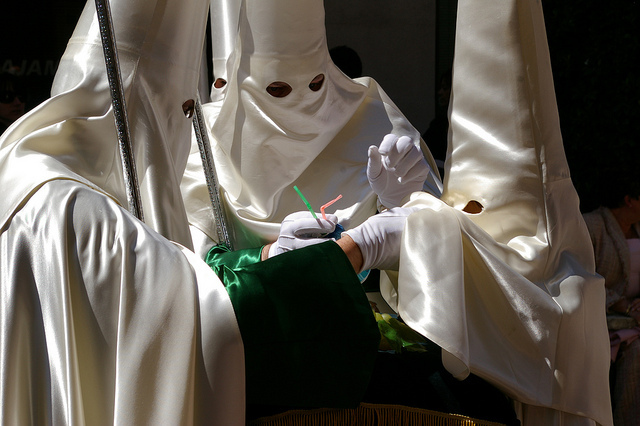 As previously mentioned, the Easter Week celebrations at Lorca are justifiably well-known. Two ‘rival’ brotherhoods, the Azules and the Blancos, annually compete with each other to see which group can organize the most spectacular displays. The wine growing centre of Jumilla is an interesting place to be when they have their wine fiesta, Vendimia; its motif is ‘Bebes o te mojo’ – drink or I’ll soak you! Calasparra, to the north-west of the region, produces what is thought to be Spain’s best rice. In September, though, they have Pamplona-style bull runs in the narrow streets of the town, for the bravest only. In May in Caravaca de la Cruz there is a week long festival of horses where elaborately decorated horses hurtle through the streets in races. Finally, Cartagena, in September, sees the residents don Roman and Carthaginian costumes and party the nights away although, this being Spain, there’s always a fair share of Elvises as well, for some bizarre reason. Because of the excellence of rice from Calasparra visitors really should try it whilst they are here. It is popular served with chicken, with vegetables, with rabbit and snails and with beans. Fish soup is another local speciality on the coast – a wonderfully rich concoction. There are well-known wine areas around Jumilla, Bullas and Yecla, producing some especially nice red wines. Are You Familiar With Murcia? If you’re familiar with this part of Spain please tell us your story or share useful tips with fellow visitors in the comments section below. We have had a holiday home in the Murcia region for the last 8years or so in a little fishing village called Los Nietos on the Mar Menor. We have visited all of the places you mention in your article but there are so many more interesting places. Cabo de Palos a great centre for the divers, lots of fish restaurants, fabulous walks beautiful beach & overlooked by an old lighthouse. Los Alcazares, another interesting place with a beautiful promanade, lots of Spanish families visit the beaches here all year round. Then there is San Pedro del Pinatar with its wonderful Marina, great restaurants and the beach runs along side the Med. So many lovely Spanish towns along side both the Mar Menor & the Med I could name many more – this is an area well worth visiting. I did enjoy your tour on Murcia, yes I have been to this town and it is really nice, big and busy as you say. I have visited a cathedral which I was told it was a mosque at one time it was round. I did not have food there as it was only a short visit, but next time I will on your recommendation of the rice which I love. I travelled from Torrevieja. This is another town you should visit. There are some amazing restaurants there and the tapas is wow.